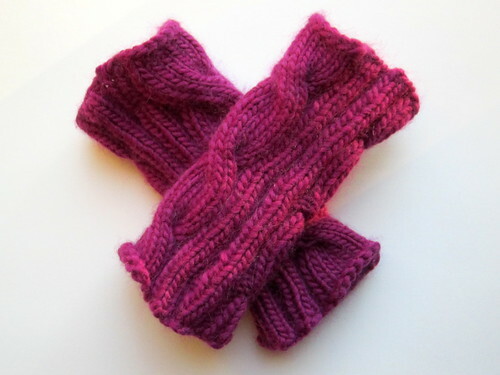 I'm really proud of these raspberry-colored fingerless mitts that I knit up over my Christmas vacation. Back in November, I was shopping for yarn for a Honey Cowl at my local yarn shop, Knit Stop, when I spotted one of these mitts on display. It had a tag on it with the pattern name, and when I slipped it on, I immediately knew I had to make a pair for myself. 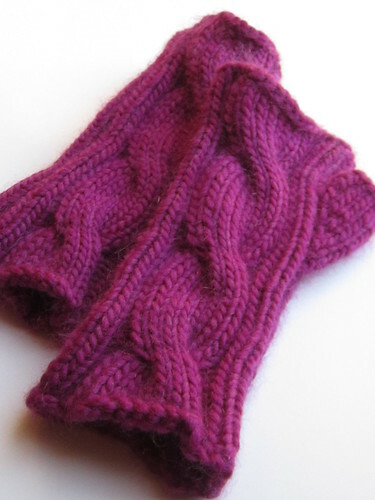 I left the shop with yarn for my cowl and a plan to return before Christmas to get the yarn and pattern for the mitts. I knew I'd have time over the break to work on some knitting for myself, but until then I still had gifts to finish making. The yarn is Classic Elite Yarns Ariosa in color Azalea. It's a merino/cashmere blend, and it's so plush and soft. The mitt I tried on in the store was a lovely pale grey, but the color selection was limited when I went to make my purchase, so I opted for this raspberry/azalea color. I firmly believe the universe is encouraging me to make this "my color," because I seem to have acquired a lot of it without really thinking -- dresses, shirts, scarves, sweaters, etc. I've never knit cables before, and it's one of those things that, no matter how many times people said "It's so much easier than it looks! Really!" I just never believed them. 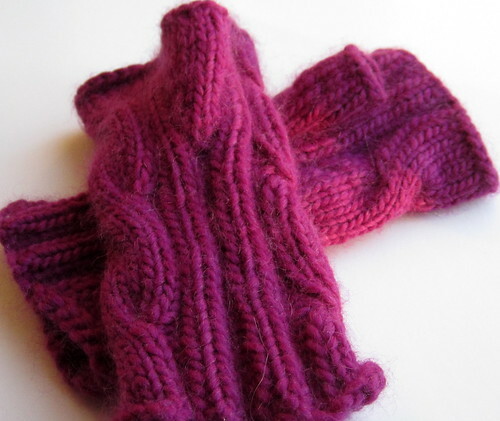 Well, it turns out knitting cables actually is much easier than it looks. 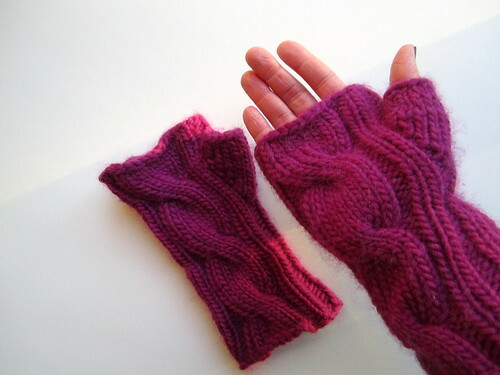 I started knitting the mitts with my mom nearby for assistance if the cables really did trip me up, and other than asking her to confirm that I was reading the pattern correctly, I'm happy to say that at no point did I utter the phrase, "Mom, can you fix this for me?" Plus, I managed to complete the pair in 2 days. 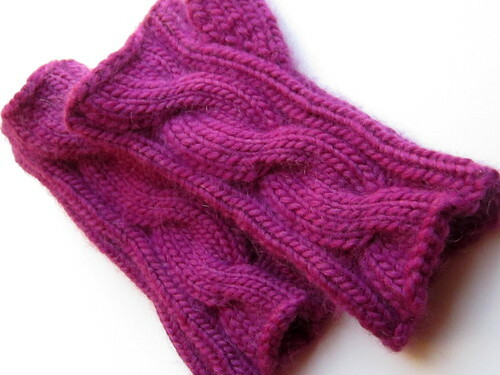 I love these mitts. The warmth of the palm and wrist make up for chilly fingertips. 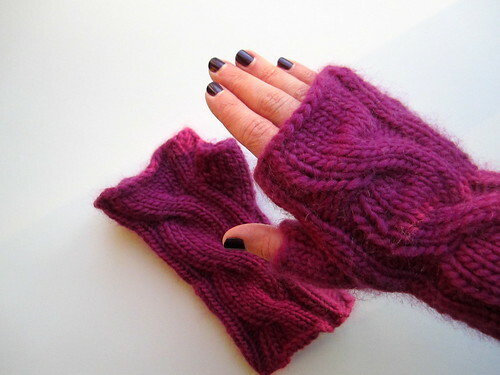 And frankly, I don't care that my fingers are cold when these mitts look so fantastic! I picked up some emerald green yarn on sale at my mom's local yarn haunt The Yarn Haven in Knoxville, TN, and I'm planning to start another pair soon.